I am a founding member of WABA, the World Association of Brick Artists. It’s a small unique group of international artists, founded less than a decade ago, but with a number of prominent exhibitions and catalogues to our credit. Artists include: Ulla Viotti (Sweden), Fritz Vehring (Germany), Gwen Heeney (Wales, UK), Jacques Kauffman (Switzerland / France) and myself. Jacques Kauffman had been invited as a featured artist to create a large indoor installation in the incredible rotunda space on the main level of the Clayarch Gimhae Museum, along with a side gallery of smaller works. He in turn, suggested that WABA artists be invited to install works in the expansive galleries of the second floor of the museum. This was my fourth or fifth visit to Korea and the second time working at the Clayarch Gimhae Museum of architectural ceramics. In 2009 I had been invited to create an outdoor piece as part of the Ceramic Architecture Now exhibition, and built Gimhae Arch, which is on permanent display. The WABA artists were invited to Korea to work as a group on an exhibition at the museum and the museum offered to cover travel expenses, housing and food, materials for the exhibition, a studio to work in, an assistant for each artist, an artist fee and produce a wonderful catalogue. Clayarch Gimhae is actually a complex of buildings, mostly exhibition spaces, but also includes a building that houses artist’s studios, ceramics facilities and living accommodations. The WABA exhibition at the Gimhae Clayarch Museum seemed a natural fit, as both the museum and WABA are dedicated to ceramics and architecture. Clayarch Gimhae Museum sent us all gallery dimensions in advance and asked us to propose a preliminary installation concept. We all arrived in Gimhae (less than an hour from Busan, Korea’s second largest city) and spent the first day acquainting our selves with the gallery spaces. The next day, we were off to the Sanham C1 brick factory that had agreed to donate brick, the raw building material for the exhibition. We were greeted at the brick factory by the father and son team who own and run the factory. It is located in an area with a rich variety of clays for brickmaking. After a fabulous lunch, which of course included a variety of Kim chi, we got a tour of the very efficient automated factory, which produces a wide variety of colors and shapes of brick. I made some adjustments to my preliminary concept after spending time in the gallery space. So much of what I create depends on the space I am given to work in, and the space always dictates the final result. I measured and taped out the footprint for the spiral stack and the serpentine line, and then covered that portion of the gallery floor with cardboard. In my allotted studio space, I set about working with the galvanized steel fencing mesh, creating a 6’ tall spiraling stack form. I had enough mesh material left to try something new, and decided to fabricate 3 smaller spiral pods forms. The forms were then outlined with flexible copper tubing attached to the inner and outer folded seams. This first phase of the installation had taken about a week. The pallets of brick I had requested arrived from the brick factory; 5,000 brick in 10 different shapes and colors. 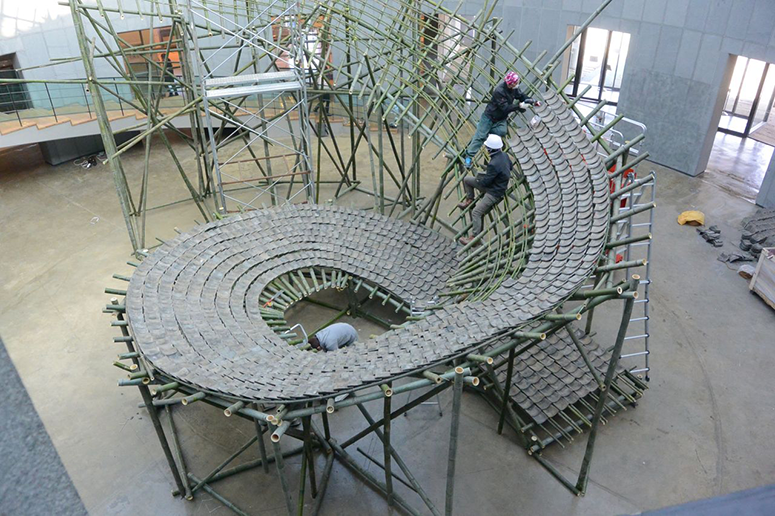 Over the course of the next week the undulating serpentine brick line evolved in the gallery, and the spiral stack along with the 3 spiral pod forms were filled with bricks. The area surrounding the Clayarch Gimhae Museum has approximately 80 working independent potteries in the vicinity. I made an effort to visit a number of potters and seek out shard piles to include pieces of local celadon wares in my installation. I was also fortunate to find a resource of wonderful Onggi or Buchong shards, ubiquitous in Korea for fermenting Kim chi. Additionally, as a way of physically connecting with the granitic geology of Korea, I procured a quantity of rounded river washed granite stones, which were also mixed into the serpentine line. The physical fabrication and installation of my piece titled: Elementary Brick, took nearly 3 weeks to complete. I explored some new directions in the installation and I am proud of the piece. All 5 of the WABA installations are strong works, and with Jacques’ main exhibition it is a dynamic representation of WABA. The museum was generous in setting up some tour days to visit temples and historic sites in the area. The temple sites and tomb mounds in and around Gyeongju were outstanding. Additionally, I took the high-speed train to Seoul to spend some time with my Korean friends Hun Chung Lee (and his wife Hyunjoo) and Jiman Choi, both former Archie Bray Foundation residents. Outstanding sites included the Leeum Museum and the Dongdaemun City Center. The official opening of the exhibition was February 27th and the exhibition will be open until mid-August 2015. The opening ceremony was attended by many, including the US and Swiss ambassadors, government officials, dignitaries and guests. Please visit if you are in Korea over the next 6 months; I guarantee it will be worth the effort.